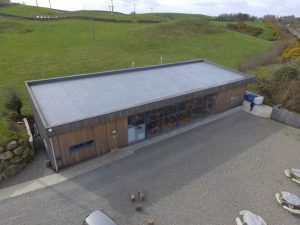 Nestled on the edge of Newton Stewart in Dumfries and Galloway, the Crafty Distillery’s modern grain to glass distillery doesn’t just pump out gallons of tasty gin, but is also offers a fantastic place to sit and eat and relax with family and friends whilst enjoying stunning panoramic views over the Galloway Hills. I was recently invited along for a tour and to find out all about the distillery for myself by Graham Taylor the owner. What started as an idea in 2014 was then established in 2016 with the dream of one day constructing and opening their own distillery in the heart of Dumfries and Galloway. In May 2017 their dream came true when they opened the doors of their state of the art distillery built on land owned Graham’s father. 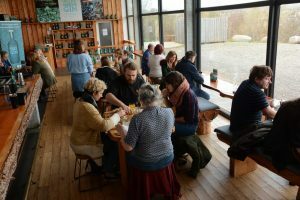 In July 2018 they then opened the Tree Bar & Cafe where their unique Galloway Picnic concept brings you a unique taste of Galloway from the region’s best producers from a 40 miles radius of the distillery. Grab a basket and a chopping board, then help yourself to fresh bread, a range of cheeses from the Ethical Dairy at Gatehouse of Fleet, pate’ from Castle MacLellan in Kirkcudbright, meats from local butcher D Owens, smoked goods from just along the road at the Galloway Smokehouse, a range of preserves from Galloway Lodge and Galloway Chillies and Ice Cream from Cream O Galloway. They also serve up some fantastic artisan roasted coffee and tea from ‘The Good Coffee Cartel’ based in Glasgow and a range of Crafty Cocktails are available from the bar. Crafty Distillery boasts the honour of being one of the few that also creates its own alcohol from scratch. Also wanting to involve flavours from the region surrounding the distillery into their product, Hills & Harbour Gin uses locally grown wheat and some local botanicals with an in house ‘grain to glass’ distillation process. Perfection takes time though and over 90 different recipes were tried and tested with the public and trade all giving feedback before creating their final gin. Graham said “It was back in April 2014 when we decided to try and make a living from doing what we do best – talking nonsense and drinking. Around that time there was a big shift happening in the spirits market, with more and more smaller distilleries popping up all over Scotland, so we thought we would have a bash ourselves. All we had to do was figure out what would make us a bit diferent. After a good few months of spirited debates, Crafty Distillery was born. Our plan was simple, we wanted to create tasty ‘grain to glass’ spirits for everyone who likes a tipple, not just gin-thusiasts and whisky buffs. That’s why our tagline is ‘Keeping everyone in good spirits’. When I walked into the large wooden lined building that houses the distillery with it’s large floor to ceiling windows there is a wonderfully bright and airy atmosphere in the busy ‘Tree Bar and Cafe’ area, straight away you could see and feel what makes them different. With a very warm welcome, you really feel that there are no secrets and that all the staff are very proud of their building and the products they produce and sell. Behind the bar which is made from a locally felled 20ft long Douglas Fir tree trunk that sits on local granite blocks, there is a wall of glass which lets you see straight into where the stills are installed and the magic happens. This is where our tour guide for the day Craig Rankin the Distillery Manager met us and started telling us the story of how he and Graham worked together to create the award winning Hills and Harbour gin from grain to glass. The Crafty Distillery – Tour, Taste and Mix, takes visitors on a guided tour of the modern distillery, lifting the lid on the liquid-sorcery of the distilling. I found the tour to be highly educational and fun, Craig had a real sense of humour, and told the story of Hills and Harbour in an interactive way, teaching us how their gin starts off as beer and is gradually refined through the distilling process to the fine spirit that only becomes gin with the addition of Juniper berries plus the chosen botanicals to give it it’s flavour and depth. The tour really helps you learn about the unique distilling approach at the Crafty Distillery and at the end, you get to enjoy a taste your Hills & Harbour Gin in the bar. After experiencing the tour for myself I can see what a brilliant visitor attraction Graham and Craig have created for Dumfries and Galloway, this modern and stylish destination is for everyone; for locals and visitor to the region alike, you don’t have to even like gin to enjoy the place, if you are just looking for somewhere totally different to go and eat, or to sit and have a coffee and read a good book or admire the stunning views, then the Crafty Distillery is a destination that you need to visit. So get down to Newton Stewart and enjoy a Hills and Harbour Gin for yourself and soak it up with a unique ‘Galloway Picnic’ at the Tree Bar & Cafe. Also, you can purchase a bottle or two to take home with you. Images taken by R.B Phptography for DGWGO.